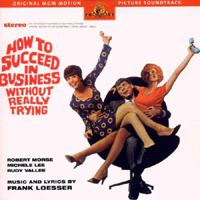 Film Soundtrack, 1967 (United Artists/MGM) (2 / 5) Several of the original Broadway cast members appear in the film version of How to Succeed…, but Michele Lee is Rosemary, and she does a much better job with the songs than Bonnie Scott, sounding warmer and far more natural. However, she doesn’t have many songs: “Happy to Keep His Dinner Warm” and “Paris Original” were both excised from the stage score for the movie. Lee does perform a solo version of “I Believe in You,” but is otherwise heard only in the trio “Been a Long Day.” Robert Morse, Rudy Vallee, Sammy Smith, John Myhers (as Mr. Bratt), and Ruth Kobart (as J. B. Biggley’s executive secretary) all sound good here, and although Anthony Teague doesn’t have Charles Nelson Reilly’s nervous energy, he’s fine as Frump. The “Coffee Break” number is on this soundtrack album but is not in the film, having been cut from it. While the incompleteness of this recording diminishes its appeal, avid Loesser fans may value it. — M.M. 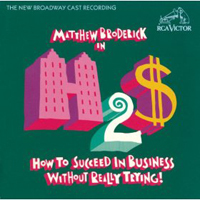 Broadway Cast, 1995 (RCA) (2 / 5) This is a very full recording. In addition to the show’s voice-over passages (spoken by Walter Cronkite! ), it includes some incidental music, a number of reprises, and even the Pirate Dance. The album boasts new orchestrations by Danny Troob that are even brassier than the originals, a reworked “Brotherhood of Man” with a lot of scatting from Lillias White as Miss Jones, and a new second-act opener. There’s also a reprise of the title song (with new lyrics written by the production’s director, Des McAnuff) in place of the cut “Cinderella, Darling.” If these changes aren’t really improvements, neither are they significant detriments. 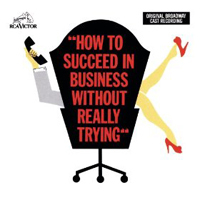 Megan Mullally is an ideal Rosemary, and Victoria Clark provides a very well sung Smitty. Jeff Blumenkrantz is Frump; other roles are well done by Ronn Carroll, Gerry Vichi, and Jonathan Freeman. Luba Mason’s Hedy is a bit too vacant, though she makes quite a vocal effect when she slides up a full octave at the end of “Love From a Heart of Gold.” But then there’s Matthew Broderick, singing and acting in the same constipated style that he would later bring to The Producers and other shows. While he hits all the right notes in Finch’s songs and only sounds strained a couple of times, he never sounds real. — M.M.